Lightning strokes are nature’s crude way of disposing-off excess frictional energy dissipation among clouds. Arcs ranging up to thousands of volts break the insulation of air and strike the highest and vulnerable points on ground. If not controlled and provided an alternative path, these surges can destroy almost any structure that comes between their paths to the ground. Read this article by Kam, an electrical engineer who sent us this essay by email. Electrical installations are particularly more vulnerable to the effects of lightning strokes. High voltage surges of amplitudes more than those of rated values create havoc for delicate electronic parts. Basically there are two ways an electrical grid system can be hit by an over-voltage lightning strike. Mostly the lightning surges enter via the long and exposed transmission lines by travelling all the way through phase conductor (s). Grid system equipment is protected by well calibrated lightning arrestors commonly known as LAs. 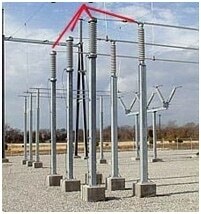 Transmission lines (MV, LV and even HV) are always protected by a structural setup commonly known as shielding. In this post, we will be discussing the shielding method for transmission lines’ safety against direct lightening strokes. As evident from the name, shielding of a transmission line means to create a considerable hurdle (in the form of an alternative path to the ground) between the lightning stroke and the electrical installation. An earth-wire also known as the grounding conductor is installed at a slightly higher altitude than that of the phase conductors and it is short circuited with the metallic body of every tower/pole. Transmission lines’ towers and poles are always grounded at minimum impedance for this purpose (lesser than or equal to 5 ohms approximately). For larger transmission lines, more than one shielding conductor may be recommended by the designer. A properly designed and installed shielding conductor usually provides the lightning protection angle of 30o w.r.t the highest phase conductor. 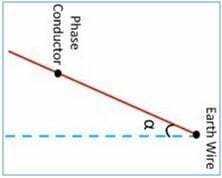 The concept of shielding angle is also explained by the diagram attached. The shield wire should always have sufficient mechanical strength so as to bear the tensional forces exerted by the towers and environmental agents. The displacement distance between the shield wire and phase conductors should always be more than the minimum electrical clearance required. Clearance distance should remain above the minimum safe distance at lowest sag points under different environmental temperatures. For adequate protection of electrical conductors and tower structure, the grounding resistance of transmission towers or poles should always remain under 5 ohm (standards may vary geographically). Greater impedance may cause structural damages to the tower footings. If the impedance of the structure is too high, the surge can also travel all the way to the grid station and damage the power equipment. Although the grid system equipment (Transformers, breakers and GIS setup) are well protected against the lightning surges, effective shielding of incoming/outgoing transmission lines is equally important. Un-guarded phase conductors can harness dangerous surge potentials which can cause rupture of multiple insulator strings along the transmission line. Un-shielded transmission lines also pose a safety hazard to the workers availing a maintenance related shutdown of a transmission line. 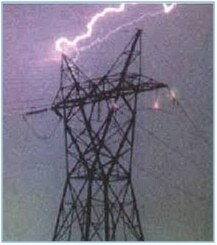 or copy this trackback: http://engineering.electrical-equipment.org/safety/shielding-of-mv-transmission-lines-and-substations-from-lightening-strokes.html/trackback from your own site.